"Civilian life? That's ages ago." Conan (Philippe Torreton) burns his way across the chaotic battlefield while slashing throats and causing violent destruction. He commands a group of fifty "warriors" who differ in his mind from the "soldiers" of the rest of the army. Their method of attack is close and brutal, and lacks the impersonal technologies of war. They function as killing machines who feel alive amidst the dark recesses of trenches, camps, and the bloody battlefield. 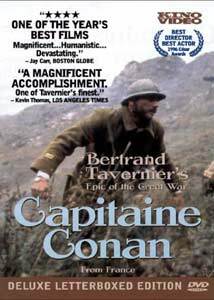 In his new film Capitaine Conan, acclaimed French director Bertrand Tavernier ('Round Midnight, Sunday in the Country) takes us into the French army in the Balkans during the conclusion of World War I. The story begins in the days before the signed Armistice, and it quickly showcases the dark and destructive nature of the war. But this is not a typical war film in the vein of Saving Private Ryan or Gettsyburg. Instead, a majority of the film focuses on the time following the end of the actual war. Can these men, who were created to fight and destroy, remain sane in a calmer world? Torreton's Conan stands as the prime example of a nearly perfect fighting machine. His advance across the field showcases his confidence and absence of fear or nervousness. On the battlefield, Conan functions with only one mission: to kill his enemy. But he is not a monster who lacks any human attributes or abilities. This complexity becomes intriguing when he deals with Norbert (Samuel Le Bihan), a friend who enters the judicial side of the military. Norbert believes in the law, but dislikes having to betray Conan and his men to achieve justice. When masked men rob the Crystal Palace, a local establishment, and murder two women, Norbert draws the task of prosecuting the case. Conan's men immediately draw suspicion, and this places the two friends on opposing sides of the issue. The Crystal Palace conflict would function nicely as the prime focus of another film, but Tavernier does not seem interested in a single issue or event. Based on a novel by Roger Vercel, Tavernier and co-writer Jean Cosmos's screenplay strives to examine the souls of the "warriors" who struggle to live during peacetime. The story also explores the disparity between the living conditions of the soldiers and the higher officers. General Pitard de Lauzier (Claude Rich) spends his hours complaining about minute details in his office or train car and loathes his extravagant food. This dim-witted character exists as a symbol of the French military leadership and its inability to understand the realities of the war. Norbert stands in the middle between the rebellious tendencies of Conan and the inadequacies of the general and his officers. An intriguing subplot of the main story involves the fact that the men must remain in service nearly a full year after the official conclusion of the war. When the soldiers wish to journey home, they face imprisonment as traitors of the French army. When a battle finally occurs with the Red Army, they must break out of prison to save their fellow soldiers. Once Conan enters the fight, he again appears in his element and comfortable. When the opposing army has retreated, his excited visage still seeks more fighting and blood. Capitaine Conan contains a tremendous amount of insight and presents numerous questions about the nature of war and its participants. Countless issues concerning justice, duty, and humanity arise within the story of Conan and Norbert. An unfortunate drawback is an extremely slow pace that sometimes separated me from the actions on the screen. Tavernier directs the battle scenes with a hand-held camera that helps to generate the chaotic nature of the action. Unfortunately, the personal scenes often appear too static and detached within the bleak tone of the film. Norbert's conflicts and Conan's restlessness are understandable and interesting, but the direction alienated me several times when my emotions should reside strongly with the characters. Philippe Torreton brings a surprising level of humanity to a Conan character who could generate disgust from the audience. His final scene is a sad and disturbing statement on the ultimate destination for a warrior. Samuel Le Bihan does a solid job presenting Norbert's inner turmoil and revulsion at the off-duty killings. The film spends a tremendous amount of time with Norbert, and a lesser acting performance would make the story uninteresting and tedious. Bertrand Tavernier has created an epic war film that spends a majority of its running time away from actual battles. While the pace is slow, including several long sequences that may test attention spans, the issues tackled in Capitaine Conan are complex and interesting. These problems usually remain in the background of war films, but Tavernier brings them to the foreground. No simple answers exist to his questions, and this adds to the importance and power of the film. Image Transfer Review: Kino's "deluxe letterboxed edition" of Capitaine Conan fails in nearly all aspects of its visual presentation. The black levels are extremely poor, and the colors appear muted and unclear. While this does correspond with the dour tone of the film, the overall lack of sharpness and clarity in the transfer refutes that argument. There are numerous glitches and large amounts of grain on the picture that render some scenes difficult to comprehend. This transfer resembles a mediocre videocasette picture, and it detracts from the power of the film. The widescreen presentation keeps this disc from being a complete failure, but it still ranks low on the scale in terms of visuals. Audio Transfer Review: The 2-channel PCM audio mix for Capitaine Conan captures the chaos of the battle scenes and assists in the "you are there" feeling. The explosions arise from all sides of the sound field, and this adds to the impact of the story. Unfortunately, the lack of a 5.1 Dolby Digital mix left me wondering what might have been. The disc includes a solid sound mix, but it would have benefited from the option of a digital track. Kino loses points for following the easy route and avoiding a more elaborate sound presentation. Extras Review: This disc includes only one extra feature, Un Film Sur Bertrand Tavernier, a 54-minute documentary about the director and the making of the film. This lengthy and intimate behind-the-scenes look provides plenty of background and insight into the production of Capitaine Conan. Tavernier and his staff are forthcoming and honest about the film's direction and the numerous problems faced during production. Bertrand Tavernier is a colorful, white-haired Frenchman who prides himself on only making the films he wants to make. During filming, we see plenty of glimpses of his nervousness and constant worrying. However, Tavernier exhibits an enjoyment and love of filmmaking that you cannot fake for a documentary. He spends a good deal of time discussing the difficulties of filming in Romania, the "country of darkness" to him. Daily disasters occurred due to the language barrier and differences between the two cultures. Un Film Sur Bertrand Tavernier is presented in an attractive full-frame format with several scenes included in their letterboxed form. It avoids the usual promotional backslapping and instead presents an interesting look at a talented director. While the disc could have benefited from additional extras, this documentary mostly makes up for this absence. Hopefully, future DVD releases will continue to provide this more personal view of filmmaking. Bertrand Tavernier's Captaine Conan won several well-deserved Cesar® awards (the French equivalent of the Academy Awards®) in 1996 for its director and Philippe Torreton. It stands with the premier war films of the past decade in terms of its complex themes and well-rounded characterizations. Tavernier's detached direction and the film's slow pacing tested my patience several times. However, the compelling story and solid acting helps the film to overcome these drawbacks and remain interesting throughout most of its lengthy running time.